The tutorial explains the essence of the standard deviation and standard error of the mean as well as which formula is best to be used for calculating standard deviation in Excel. In descriptive statistics, the arithmetic mean (also called the average) and standard deviation and are two closely related concepts. But while the former is well understood by most, the latter is comprehended by few. The aim of this tutorial is shed some light on what the standard deviation actually is and how to calculate it in Excel. The standard deviation is a measure that indicates how much the values of the set of data deviate (spread out) from the mean. To put it differently, the standard deviation shows whether your data is close to the mean or fluctuates a lot. The purpose of the standard deviation is to help you understand if the mean really returns a "typical" data. The closer the standard deviation is to zero, the lower the data variability and the more reliable the mean is. The standard deviation equal to 0 indicates that every value in the dataset is exactly equal to the mean. The higher the standard deviation, the more variation there is in the data and the less accurate the mean is. 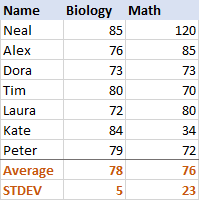 For Biology, the standard deviation is 5 (rounded to an integer), which tells us that each student's score is no more than 5 points away from the mean. Is that good? Well, yes, it indicates that the Biology scores of the students are pretty consistent. For Math, the standard deviation is 23. It shows that there is a huge dispersion (spread) in the scores, meaning that some students performed much better and/or some performed far worse than the average. In practice, the standard deviation is often used by business analysists as a measure of investment risk - the higher the standard deviation, the higher the volatility of the returns. Population includes all of the elements from a data set. Sample is a subset of data that includes one or more elements from the population. Researchers and analysists operate on the standard deviation of a sample and population in different situations. For example, when summarizing the exam scores of a class of students, a teacher will use the population standard deviation. Statisticians calculating the national SAT average score would use a sample standard deviation because they are presented with the data from a sample only, not from the entire population. To visualize what's actually going on, please have a look at the following images. In this example, the mean is 5, so we calculate the difference between each data point and 5. So far, the sample standard deviation and population standard deviation formulas have been identical. At this point, they are different. Why this difference in the formulas? Because in the sample standard deviation formula, you need to correct the bias in the estimation of a sample mean instead of the true population mean. And you do this by using n - 1 instead of n, which is called Bessel's correction. In Microsoft Excel, standard deviation is computed in the same way, but all of the above calculations are performed behind the scene. The key thing for you is to choose a proper standard deviation function, about which the following section will give you some clues. Overall, there are six different functions to find standard deviation in Excel. Which one to use depends primarily on the nature of the data you are working with - whether it is the entire population or a sample. To calculate standard deviation based on a sample, use one of the following formulas (all of them are based on the "n-1" method described above). 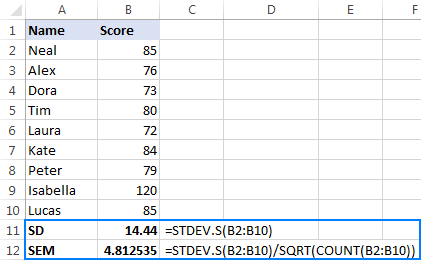 STDEV(number1,[number2],…) is the oldest Excel function to estimates standard deviation based on a sample, and it is available in all versions of Excel 2003 to 2016. 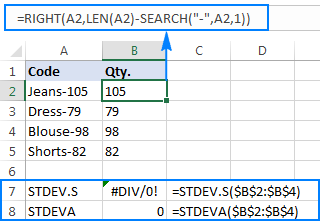 Excel STDEV can accept up to 255 arguments that can be represented by numbers, arrays, named ranges or references to cells containing numbers. Logical values and text representations of numbers supplied directly in the list of arguments are counted. In arrays and references, only numbers are counted; empty cells, logical values of TRUE and FALSE, text and error values are ignored. Note. Excel STDEV is an outdated function, which is kept in the newer versions of Excel for backward compatibility only. However, Microsoft makes no promises regarding the future versions. So, in Excel 2010 and later, it is recommended to use STDEV.S instead of STDEV. 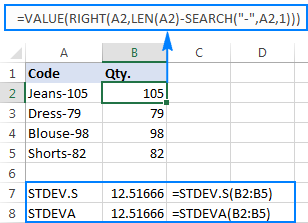 STDEV.S(number1,[number2],…) is an improved version of STDEV, introduced in Excel 2010. Like STDEV, the STDEV.S function calculates the sample standard deviation of a set of values based on the classic sample standard deviation formula discussed in the previous section. Note. For a STDEV or STDEV.S formula to work correctly, the supplied arguments must contain at least two numeric values, otherwise the #DIV/0! error is returned. All logical values are counted, whether they are contained within arrays or references, or typed directly into the list of arguments (TRUE evaluates as 1, FALSE evaluate as 0). Text values within arrays or reference arguments are counted as 0, including empty strings (""), text representations of numbers, and any other text. Text representations of numbers supplied directly in the list of arguments are counted as the numbers they represent (here's a formula example). If you are dealing with the entire population, use one of the following function to do standard deviation in Excel. These functions are based on the "n" method. 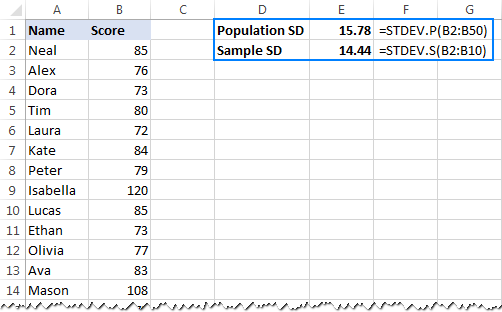 STDEVP(number1,[number2],…) is the old Excel function to find standard deviation of a population. In the new versions of Excel 2010, 2013 and 2016, it is replaced with the improved STDEV.P function, but is still kept for backward compatibility. STDEV.P(number1,[number2],…) is the modern version of the STDEVP function that provides an improved accuracy. It is available in Excel 2010 and later versions. Like their sample standard deviation counterparts, within arrays or reference arguments, the STDEVP and STDEV.P functions count only numbers. In the list of arguments, they also count logical values and text representations of numbers. STDEVPA(value1, [value2], …) calculates standard deviation of a population, including text and logical values. With regard to non-numeric values, STDEVPA works exactly like the STDEVA function does. Note. Whichever Excel standard deviation formula you use, it will return an error if one or more arguments contain an error value returned by another function or text that cannot be interpreted as a number. Which Excel standard deviation function to use? Do you calculate standard deviation of a sample or population? What Excel version do you use? Does your data set include only numbers or logical values and text as well? To calculate standard deviation based on a numeric sample, use the STDEV.S function in Excel 2010 and later; STDEV in Excel 2007 and earlier. To find standard deviation of a population, use the STDEV.P function in Excel 2010 and later; STDEVP in Excel 2007 and earlier. If you want logical or text values to be included in the calculation, use either STDEVA (sample standard deviation) or STDEVPA (population standard deviation). While I can't think of any scenario in which either function can be useful on its own, they may come in handy in bigger formulas, where one or more arguments are returned by other functions as logical values or text representations of numbers. To help you decide which of the Excel standard deviation functions is best suited for your needs, please review the following table that summarizes the information you've already learned. Once you have chosen the function that corresponds to your data type, there should be no difficulties in writing the formula - the syntax is so plain and transparent that it leaves no room for errors :) The following examples demonstrate a couple of Excel standard deviation formulas in action. When discussing different functions to calculate standard deviation in Excel, we sometimes mentioned "text representations of numbers" and you might be curious to know what that actually means. In this context, "text representations of numbers" are simply numbers formatted as text. How can such numbers appear in your worksheets? Most often, they are exported from external sources. Or, returned by so-called Text functions that are designed to manipulate text strings, e.g. TEXT, MID, RIGHT, LEFT, etc. Some of those functions can work with numbers too, but their output is always text, even if it looks much like a number. To better illustrate the point, please consider the following example. Supposing you have a column of product codes like "Jeans-105" where the digits after a hyphen denote the quantity. Your goal is to extract the quantity of each item, and then find the standard deviation of the extracted numbers. In statistics, there is one more measure for estimating the variability in data - standard error of mean, which is sometimes shortened (though, incorrectly) to just "standard error". The standard deviation and standard error of the mean are two closely related concepts, but not the same. While the standard deviation measures the variability of a data set from the mean, the standard error of the mean (SEM) estimates how far the sample mean is likely to be from the true population mean. Said another way - if you took multiple samples from the same population, the standard error of the mean would show the dispersion between those sample means. Because usually we calculate just one mean for a set of data, not multiple means, the standard error of the mean is estimated rather than measured. Where SD is the standard deviation, and n is the sample size (the number of values in the sample). In your Excel worksheets, you can use the COUNT function to get the number of values in a sample, SQRT to take a square root of that number, and STDEV.S to calculate standard deviation of a sample. Create a graph in the usual way (Insert tab > Charts group). Click anywhere on the graph to select it, then click the Chart Elements button. Click the arrow next to Error Bars, and pick Standard Deviation. This will insert the same standard deviation bars for all data points. This is how to do standard deviation on Excel. I hope you will find this information helpful. Anyway, I thank you for reading and hope to see you on our blog next week. 12 Responses to "How to calculate standard deviation in Excel"
New topics, new learn. Thanks Svetlana..
(P2 is copying data from Q2) but instead if leaving cell blank it displays a 0. How do you think I should change the formula to have a cell stay blank instead of populating it with 0? I have to calculate the standard deviation of the centre of pressure displacement which expresses the variability of the centre of pressure at specific points in time. I will do the calculations in excel, however, I would like to know is the standard deviation formula the same for any variable for which SD is used? Thanks this has been really helpful. Can you tell me does excel calculate Stdev.s or Stdev.p when you add “Standard Deviation” from “error bars” in “Add chart element” ? For error bars, Excel actually calculates standard deviation as a single value form the given Y-values, assuming that the Y-values are individual values from one sample. As the result, the default error bars drawn by Excel are the same for all data points in a series. The formula that Excel uses for calculating standard deviation error bars can be found here. If you'd like to plot individual Std Dev error bars, you can first calculate Stdev.s or Stdev.p, depending on your data set. And then, on your chart, click Error Bars > More Options >Custom, and select the range of the calculated Std Dev values. An example can be found here: How to make individual error bars in Excel. PROF. You are a great lecturer, I am grateful to grab a bit knowledge from you within this few seconds.my regard to u. Extremely clear and comprehensive. Not everybody that knows this stuff can explain it as straightforwardly as this! Great work! I'm looking for formula wherein I need to calculate Standard Deviation only for selected criteria. Like I have A B C D and those A B C D are available in my table from where I need to pull respective numbers. So I need to calculate standard dev. for A separately, B separately and so on... Also, need to take care of excluding Zeros 0. Presently I'm using below formula. I need to add comparison to it.